Great way to create a universal windows 7 Installtion disk take a look. This little bit of software add’s a shortcut to your desktop when you put a USB stick or CD rom into your PC saving you time or explaining to your customers to go to window’s explorer and finding the mapped drive or folder. Desk Drive sits quietly in the system tray. Configuration (image below) is just a click away and allows you to specify which types of media to monitor. Disk Drive can be downloaded at the following location and is available in both 32bit and 64bit versions. In one of my pervious posts I mention a fantastic android application call Airdroid that allows you to back up and control your android product over a local wireless network. 5). Added a tools subsection on the Android AirDroid window to allow you to view lots of handy information. In conclusion this is a great step for the AirDroid program and a leap forward from the pervious version and the best thing is it is still free. Now if they only work out how to do business based Airdriod system that allows IT managers to control their fleet of Android products then this could be a great alternate to a company’s Blackberry or Apple solution. Handy bit of software that is worth a look at. Installation is quick and easy, and once complete, you can access Connectify from the icon in the Taskbar. Under settings, type in a name for the WiFi network, a password to access it, then decide the type of internet connection you want to share. 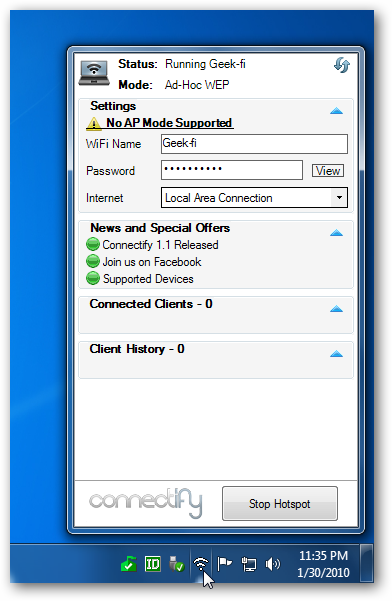 It allows LAN, VirtualBox Host-Only, Wireless Network Connection, and no Internet sharing. When you’re ready, click on the Start Hotspot button. Here is a handy piece of software that is open source that allows you to see graphically all the wireless networks visible in range of your device along with its signal strength and which channels are in use. So if you are having problems with poor wi-fi speeds or problems with internet connection speeds over wi-fi install this software and see if you need to change your wireless channel to correct the problem. One point though is that this software is no longer supported if you run into problems with it you can visit the website for old help. This how to enables you to increases the maximum transfer size of a USB storage device from the default 64KB to 2MB within windows 7 which which will increase the performance of some USB devices. 2)Click Start and type regedit in the Search box, and then press Enter. 3)Navigate to: HKEY_LOCAL_MACHINE – SYSTEM – CurrentControlSet – Control – usbstor – VVVVPPPP. 5)Click Edit menu, point to New, and then click DWORDValue. 8)Exit Registry Editor and restart your PC.